Aproveche al máximo su traslado de Calgary a Jasper gracias a este viaje de un día de ida y vuelta de 11 horas, que se detiene en algunos de los lugares más hermosos de las Montañas Rocosas canadienses. Es la combinación perfecta de viaje turístico y traslado a la ciudad, todo en una experiencia de viaje divertida y conveniente. Comience su día desde los selectos hoteles de Calgary, en autobús a lo largo de la autopista Trans-Canada hacia la ciudad de montaña de Banff. 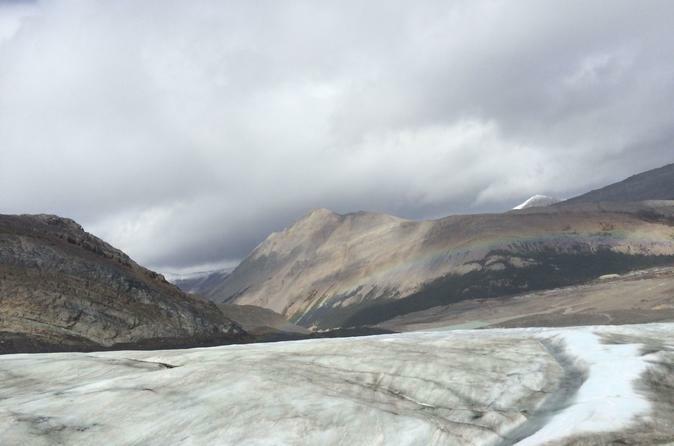 Desde allí, continuarás por Icefields Parkway, considerado uno de los recorridos paisajísticos más impresionantes de Canadá, y pasarás por dos parques nacionales, dirigiéndote a tu destino final en Jasper. Pasa por los famosos lugares naturales en el camino, que incluyen el glaciar Crowfoot, el lago Louise y el lago Peyto, que te permiten sumergirte en este increíble paisaje alpino. Pronto llegarás al Columbia Icefield, donde subirás a bordo del vehículo especialmente equipado Ice Explorer para un viaje inolvidable en la cima de un glaciar. También tendrás tiempo para almorzar antes de ir a Sunwapta Valley, pasar por Tangle Falls y el glaciar Stutfield en Mt Kitchener. El viaje también incluye tiempo para visitar Glacier Adventure y Glacier Skywalk. Haga una última parada en Athabasca Falls, llegando al final de la tarde a Jasper. Tenga en cuenta que: • Este viaje termina en Jasper y es solo de ida. • Los pasajeros pueden llevar 2 maletas por persona como máximo • Este tour es de temporada y solo se extiende de mayo a octubre. Well worth the trip! Make sure to call and reconfirm pick up point and time with the tour agency number provided it's very likely Brewster to avoid any confusion the morning of, since pick-up time is usually at the crack of dawn. We stayed at the Hyatt Regency, and no pickup was available at our hotel, but it was a short walk to the Fairmont where we and a couple of other passengers were picked up around 6:15AM. After a two hour bus ride to Banff, we transferred to our main coach at the Brewster Station, for the one-way trip to Jasper. The 10-hour trek into the beautiful Canadian Rockies has commenced! It was a long ride, but you will never feel the length since there were enough stops to alight from the bus and enjoy the scenery - one more beautiful than the next. We stopped for lunch at the Icefields Parkway Observatory - it was included in the tour, and was a buffet in the building restaurant. I suppose the place had to cater to the many Chinese tourists that descend in that area, that lunch was a weird combination of salads and Chinese dishes made poorly. We had enough time after lunch to explore the observatory, before boarding the bus for our pre-assigned tour time of the Columbia Icefield. The massive Icefield Explorer vehicles were impressive, and make sure to dress warmly. In a hot August summer, the place was about 40F and one must have sturdy hiking shoes, as the ice on the ice field is definitely tricky! Make sure to bring an empty water bottle with you, as don't miss your chance of tasting some awesome glacier water! Then off we went to another pre-assigned tour time of the Glacier Skywalk for breathtaking views. Boarding the bus again, the last stop about half an hour from Jasper is the Athabasca Falls. We arrived at Jasper close to about 6pm, enough time to check-in and enjoy this charming town for our next destination. There are so many awe-inspiring sights on this tour, it is so hard to pick a favorite. 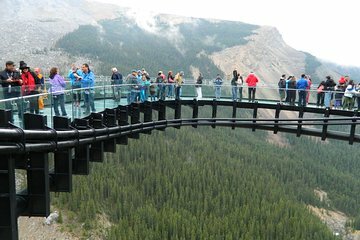 But if your trip entails a route from Calgary to Jasper, this tour is the best thing to take, hands down! The stops were well-thought of, the tours very organized, and the comfort second to none. IT IS A LONG DAY BUT THE STOPS AND SCENERY IS WELL WORTH THE LENGTH OF THE TOUR. THE MOUNTAINS, LAKES, GLACIERS AND FALLS ARE PICTURESQUE AND FOR ME ANYWAY ARE PART OF THE MOST BEAUTIFUL AREA IN CANADA. This was the longest day, and I was feeling pretty hesitant about the long journey. However, it was by far the best day of my 17 day holiday - enough pit stops, so many sights, a great guide Mitch, and the most beautiful scenery. So glad we opted to do this journey through the Rockies. This tour was absolutely amazing. Our driver was Dustin and he was informative and provided oodles of information about the area. He was easy to talk to and provided us with friendliness and service way beyond our expectations. TAKE THIS TOUR. It will create a memory you will never forget. We went with Brewsters tours who were excellent despite a miscommunication from Viator. We were led to understand the tour bus would be picking us up from our Hotel, the Delta Calgary, we were up at 6 am and waiting for the bus to arrive. The bus from Brewsters did not turn up, when we contacted Brewsters they told us they had not been asked to pick us from our Hotel but another hotel in downtown Calgary. We then had to pay 300 dollars for a taxi to catch up with the bus in Banff! The tour itself was excellent and Brewsters were helpful. Aviator were not available to help us! I would recommend Brewsters but go direct. Very good trip. Picked up 6.15am, in Calgary, transferred to a coach in Banff. First visit Lake Louise, beautiful scenery. Then onto Bow Lake, next Peyto Lake which was stunning. Lunch which was included in the price, was at the Columbia Icefields, very good. The ride on the ice explorer was great. All in all good value and we were dropped off at our apartment. Very scenic and beautiful tour. The tour guide Dustin from Brewster travel was very knowledgeable and gave lots of information.